Hey guys this is just a short post of some things I loved last month. 1- I bought this Mac Mineralize powder back in February,but I really started to use it a lot last month. It's now replaced my Rimmel London Wake me up foundation. I much prefer wearing a powder because it feels a lot lighter. 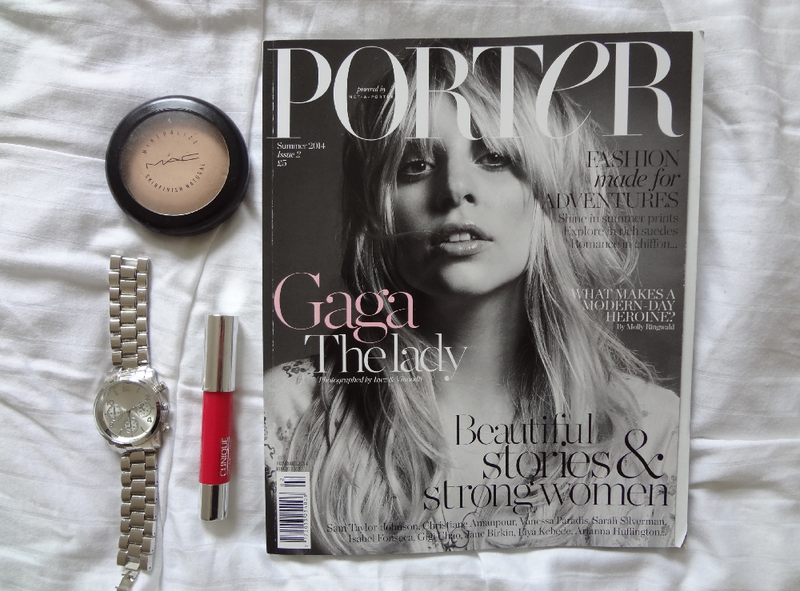 2- Net-a-Porter released their summer issue, although it's technically Spring (I think.) I got my hands on this in Sainsbury's for a £5- it was more expensive than Vogue! Nevertheless, it was 100% worth it for Gaga and all the brilliant editorials. 3- I recently bought this watch from TopShop for £25, which is a really good price for what it is. So far it hasn't tarnished but, I'm sure it will. After all, it's not a Michael Kor's. 4- Finally, my sister gave me this Clinque chubby stick as a present for being a bridesmaid. It's in the shade Chunky Cherry and I always have it on me. It goes with everything. Hope you like this short post, what are some of your favourites from the past month? Your watch is so nice, and I'd love to try that Mac powder. i just read your post and watch your photos, i liked them. thanks in advance. advice: why you do not put adsense in your blog and win money? I'm not a real fan of Gaga, but I have to admit jeez she s so beautiful here, and her facial feature could change so d'asile With make up she's incredible. I want to try that mac powder so badly! !